Grandad Science: Laser Maze™ Jr. – from Thinkfun! Laser Maze™ Jr. – from Thinkfun! In February of this year I posted a review of Robot Turtles, a board game from the Thinkfun® company that introduces important computer programming concepts to the very young. That post is one of the most viewed posts on this blog. Here is the link to that post in case you missed it. 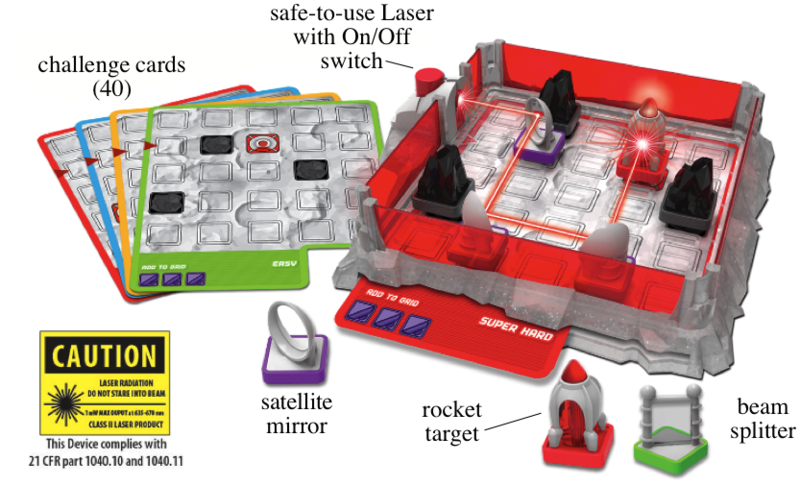 As is evident from the box cover, this post is a review of another game from Thinkfun® called Laser Maze™Jr. As I unpacked the game for the first time, I was impressed with the excellent design and the quality of construction of the plastic game base and the mirror pieces. I also like the fact that the Laser is built into the base and can’t be removed. This will keep it from being used for other purposes. The designers also paid attention to the small details that make a difference. Like the small rubber pads on the bottom four corners of the plastic base to keep it from sliding around on a smooth surface. And I really appreciate that the small screw on the battery cover is locked into the cover plate so that it can’t fall to the floor where the small-part gremlins quickly hide it in an inaccessible spot (like under the fridge). A full-color Instruction & Solutions manual is packed with the game, is easy to read, and within minutes I was trying solve one of the Challenge problems. The sturdy plastic base has a 5 by 5 grid of raised squares that lock and hold the game pieces in place. Slide one of the double-sided Challenge cards into a slot under the clear grid and you’re ready to play. The game pieces are sturdy and will survive the occasional rough handling kids will give them. I’ve drawn top views of the pieces so that you can see how the Laser beam interacts with the different types of pieces. The red-based Rocket Targets light up when the laser beam enters the elongated red face of the piece. The purple-based Satellite Mirrors reflect the incoming Laser beam 90º. The green-based Beam Splitter splits the incoming Laser beam into a beam that travels straight through the piece and another beam that reflects at 90º. The grey-based Space Rocks block the Laser beam from all four directions. There are 20 Challenge Cards with a different challenge printed on both sides of each card for a total of 40 Challenges. The division of difficulty levels is shown below. 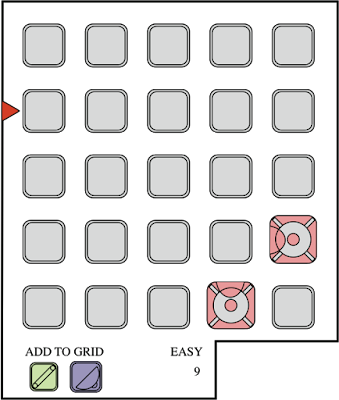 To illustrate how the game plays, I will solve Challenge Number 9. I’ve reproduced the card below. The card slides into a slot located under the raised grid so that what's printed on the card is visible through the clear plastic base. Along the upper left edge of the card is a red triangle that indicates the position of the Laser. 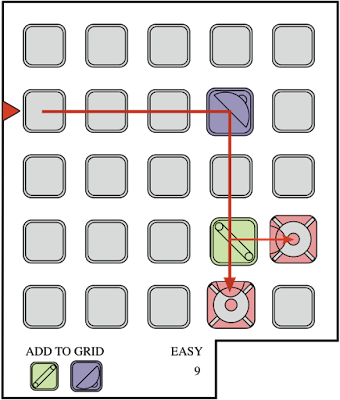 In the lower right corner of the grid are two Rocket Target illustrations. Place a Rocket Target piece over the illustration of each Rocket Target on the card. Be sure that the elongated red window in each target matches the direction shown in the illustrations. At the bottom left corner of the card is the type and number of game pieces the player is to ADD TO the GRID. For Challenge 9, the player is to place the beam splitter and one satellite mirror onto the grid. To count as a solution, every piece on the grid, with the exception of the Space Rocks, must interact with the Laser beam. At the bottom right corner of the card is the difficulty level and the Challenge number. That’s it! You now know all you need to know to help the kids work through the other 39 Challenges. Here’s a tip for the adults. Remove the Instructions and Solutions booklet from the box. Show the kids how to play the game. When they get stuck, refer to the solutions booklet, look at the game board, and give them a hint, not a solution! Thinkfun® recommends Laser Maze™ Jr. for ages 6 and older. Older includes myself as I find the Hard and Super Hard Challenges interesting and fun to solve. 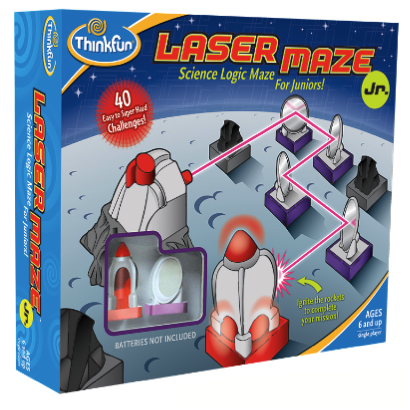 If parents, grandparents, and kids enjoy Laser Maze™Jr., Thinkfun® also offers the Laser Maze™Beam-Bending Logic Game for ages 8 and older. In my opinion, this game is one that should be in every household that has elementary school children. Grand kids Asher, Kate, John, and Andrew will love this game. As an educator, I would like to point out that Laser Maze™Jr. and similar games promote the build, test, debug, loop that if applied with persistence, usually solves a problem. This is in direct contrast to the standard question-to-single-answer process that occupies most of a student’s day at school. In other words, the build, test, debug loop is what problem-solvers do. Here's one last plus for the game. Every parent that has travelled the highways with youngsters has heard from the back seat the “Are we there yet?” question. The locked-block design of the game board and pieces makes the game pieces resistant to the jostling of the car or van. This makes the Laser Maze™ Jr. a great game to pack when taking kids on the road.